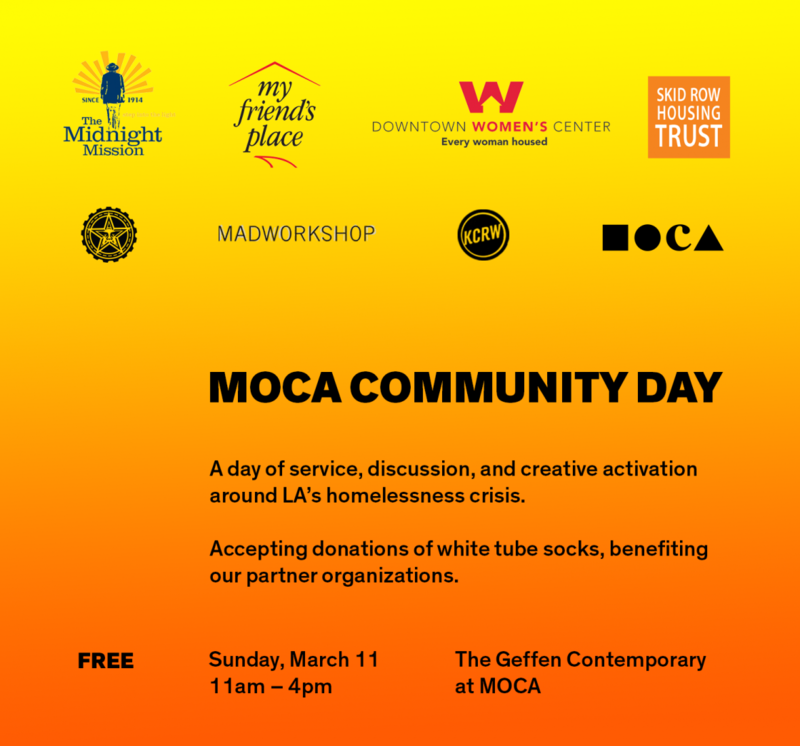 MOCA Community Day is FREE, Sunday, March 11, 2018 from 11am–4pm at The Geffen Contemporary at MOCA. MOCA joins forces with community partners My Friend’s Place, Midnight Mission, Downtown Women’s Center, Skid Row Housing Trust, OBEY GIANT, MADWORKSHOP, and KCRW for a day of service, discussion, and creative activation around LA’s homelessness crisis. How can LA’s creative communities be changemakers in this arena and what can these communities teach us about their experiences? This daylong event hopes to create a larger, more inclusive conversation around the issue by offering and encouraging meaningful action that will create a safer and healthier city for all. Accepting donations of white tube socks, benefiting our partner organizations. Available seating to the panels is on a first come, first served basis. Heather Carmichael is the Executive Director of My Friend’s Place, where she has worked for nearly 18 years. A Licensed Clinical Social, Carmichael has focused her career on addressing the complex needs of homeless, runaway youth, and street engaged youth. June Cigar moved in to a Skid Row Housing Trust supportive housing community after experiencing homelessness. While there, she regained her health and discovered a passion for art; she is now a certified artist with Piece by Piece, creating commissioned mosaic works. Shepard Fairey has called Los Angeles home for more than a decade and is active in local, national, and global awareness programs, creating art for social, political, and environmental causes. Penney Manning enrolled in the Downtown Women’s Center’s workforce development program where she first learned to make soy candles, soap, and other handmade products for DWC’s social enterprise, MADE by DWC, where she has since been hired. Dominique Moody, artist and creator of the NOMAD46, an artist residence on wheels, moved from place to place as the child of a military family. This experience provided her with a special understanding of architecture and the art of having to recreate home in different environments and circumstances. Michael Arnold is President and CEO of The Midnight Mission, a social service provider serving the Los Angeles Skid Row area since 1914. Sofia Borges Sofia Borges is a Los Angeles-based writer, designer, educator, and curator. She is the director of MADWORKSHOP, a design education foundation. Betty Chinn is an activist and philanthropist who has worked to better support those in need over her lifetime. Chinn has been awarded the Presidential Citizens Medal by President Barack Obama in 2010 for her contributions to American society. Saul Gonzalez is the host of the podcast There Goes the Neighborhood: Los Angeles and a reporter at KCRW. Gregory Kloehn is a Bay Area artist who runs The Homeless Homes Project, an asymmetrical approach to modern living with the aim to provide shelter to those without homes.